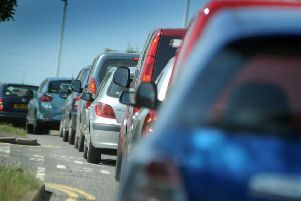 A resident described the roads around Camber Sands as ‘absolute chaos’ as 30,000 tourists travelled to the resort on bank holiday Monday (May 7). Carly Bowler, 28, who has lived in Marchants Drive, Camber, for 22 years, said she was forced to walk her one-year-old son into the road to get around cars that had parked onto pavements in her road and on other roads approaching the beach. She said: “There were thousands of tourists travelling down to the beach on Monday and by about 9.30am the roads were packed. “This made tourists angry because they had travelled a long way to find they had nowhere to park. I don’t blame them for being frustrated but there was no need for the verbal abuse I and a number of my neighbours received. Carly said parking attendants were ignored by motorists who tried to ‘intimidate’ them by driving towards them. She said a number of her neighbours had cars parked on their driveways and a group of 20 adults even started having a barbecue outside one property in her road. She added: “There was no way we could get into our cars and drive anywhere because our roads were blocked and other cars would have parked across our drive. The Hastings and Rother police commander chief inspector Steve Curry said where motorists caused obstructions or created other problems through inconsiderate parking, his officers would endeavour to take action. Nevertheless, chief inspector Curry said he wanted to make it clear that obstructing the highway was ‘wholly unacceptable’. He added that it was his understanding that Rother District Council, with whom police has sought to work closely over such issues, is shortly expected to ask East Sussex County Council to bring in measures for civil parking enforcement. This would leave just seven local authorities in the UK – including neighbouring Wealden – still reliant on police. However, it was likely to be April 2020 before the change becomes fully effective and during the interim it was hoped that more targeted enforcement could be used to help tackle problems. A spokesman for Rother District Council said: “Camber was not unusual, along with other beaches around the UK, hitting saturation point with temperatures soaring into the late 20s. “Before the start of each summer season, we work closely with East Sussex County Council, Sussex Police and other organisations to identify potential issues, keep visitors safe and try to minimise the impact of visitor numbers on the local community. “This year we will improve communication with drivers approaching the area, using electronic road signs installed on two main routes into Camber, warning them in advance of traffic congestion and advising them when the car park is full. “On weekends where we are predicting high visitor numbers, we use our website, local radio stations, and social media to alert visitors to the fact that the beach is expected to be extremely busy, and work with the police to continue to update them on traffic and congestion throughout the weekend. “We are also trialling a change in the way in which people enter the main Western Car Park, moving from a pay on entry system to one where they drive straight in, park and then pay. This is to move vehicles off the carriageway and into the car parks more efficiently. Police said by lunchtime on Monday the 30,000 sunseekers descending on the resort had caused all available car parks to be full and two hour queues developed on access roads as motorists tried to reach the beaches. Police were also asked to deal with no fewer than 14 incidents involving missing children. Chief inspector Curry said in one instance a child was found half-a-mile away from its parents and another youngster had got dangerously close to the water’s edge before being found.